Some shrimp love freshwater, others love saltwater. Some are big, others are tiny. Certain shrimp coexist with fish just fine, while some are awfully mean to other aquarium inhabitants. What might sound like the beginning of a children's story is the reality that all aquarium owners must face: shrimp are so diverse that there is no one-size-fits-all habitat, so your aquarium setup depends on what type of shrimp you have. Shrimp typically love cover, especially the youngsters who flee in fear of larger aquarium inhabitants. Aquarium moss and plants serve as the perfect type of cover, giving shrimp the opportunity to hide inside foliage and the dense mats of moss. The invertebrates also enjoy climbing on and swimming along the green growth. For additional cover, consider placing house-like structures inside your aquarium, such as caves, terracotta pots and fish castles. You can also create your own shrimp homes by cutting small sections of PVC pipe, arranging the sections in a pyramid shape -- two on bottom, one sitting on the top, like a stack of logs -- and applying silicone to hold them together. The large majority of aquarium shrimp live in either saltwater or freshwater. Some shrimp require brackish water to breed, but otherwise typically live in freshwater. Brackish water contains more salt than freshwater but not enough to be considered saltwater. Always research what type of shrimp you're getting. A shrimp placed in the wrong type of water will not survive. Examples of freshwater shrimp include red cherry shrimp, bamboo shrimp, bee shrimp, amano shrimp and tiger shrimp. Saltwater shrimp include peppermint shrimp, coral banded shrimp, mantis shrimp, pistol shrimp and common marble shrimp. Amano shrimp and bamboo shrimp both require brackish water to breed. Most shrimp require water temperature between 65 and 82 degrees Fahrenheit, but always research your specific shrimp. Some shrimp are known as filter feeders. They require water flow to eat. As the water current pushes past them, they stick out their little arms, which resemble tiny fans, and trap food particles. They often position themselves near the aquarium's filter output, where the water flow is strongest. If your filter doesn't provide enough flow that you see generous water movement in your tank, add a powerhead. Powerheads take water in and pump it out to strengthen the current in your tank. Examples of filter-feeding shrimp include bamboo shrimp, viper shrimp and Asian filter shrimp. Just like any other aquarium inhabitant, each shrimp species varies greatly in size. You can safely keep red cherry shrimp, which mature at 1 inch or less, in a 2 1/2-gallon tank. In contrast, bamboo shrimp can grow to almost 4 inches in length and require about 20 gallons minimum. The number of shrimp you plan to add also plays a large part in the recommended aquarium size. Five to 10 red cherry shrimp will do just fine in a 2 1/2-gallon tank, but any more than two or three bamboo shrimp in a 20-gallon tank is too much. Generally, if a shrimp can fit inside one of your fish's mouth, the fish may eat it. That's one reason cover is important. Your shrimp may also attack your fish and other aquarium inhabitants, depending on the species of shrimp. Ghost shrimp, for example, can occasionally turn aggressive. Typically, freshwater aggressive shrimp won't kill your healthy fish, but they can nip at and harm the fins of long-finned fish, such as tetras and betas. Sick fish are another story, because some shrimp are scavengers and can easily catch the unhealthy fish. 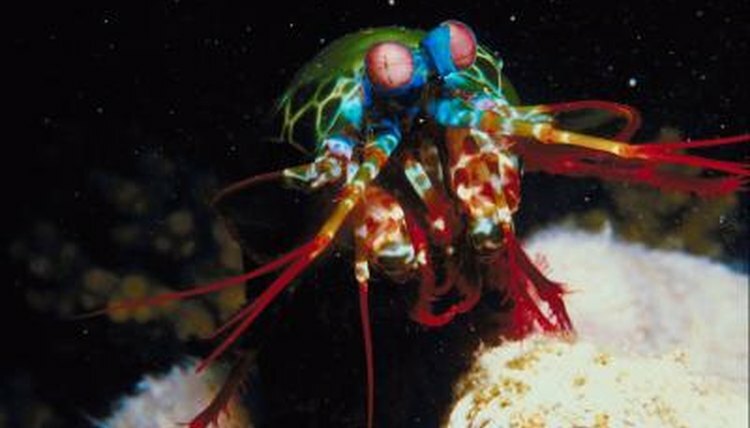 Certain types of saltwater shrimp, such as mantis shrimp, pistol shrimp and coral banded shrimp, will or can attack and kill snails, crabs, other shrimp or fish. Some saltwater shrimp also eat coral, including camelback shrimp and mantis shrimp. If you decide to bring a mantis shrimp home, you must keep it in an acrylic tank. They can break through glass.